Conservation is key to saving the Earth’s precious resources. The simple truth is that while global population continues to grow, our planet has limited natural resources. Every generation must work to minimize their global impact to ensure adequate resources for future generations. 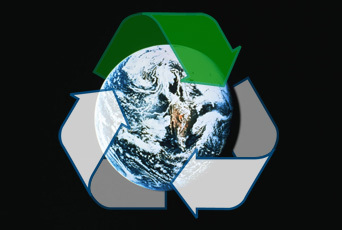 “The Three Rs: Reduce, Reuse, Recycle” is a nice little slogan that most have heard at one point or another. “Recycle” seems to be the media darling of the trio, getting most of the attention and publicity. However, “Reduce” really is at the apex of this triangle. You see, we must first Reduce what we consume or else we will soon exhaust our supply. Next, we must Reuse what we can, further reducing the amount of durable goods we consume. Finally, we must Recycle as much of what we can’t reuse, again reducing our planetary drain. This article, part two in a five-part series, examines waste, food, water and energy along with some simple changes that can make a large impact. But realize this is only the tip of the iceberg. Let this be a starting point for a lifelong change. As you start to incorporate a few changes into your lifestyle, be proactive and seek out a few more changes. Before you know it, you’ll be a conservation pro. We are a disposable society. The EPA estimates that in 2005, some 245 million tons of municipal solid waste (garbage, that is) was chucked in the U.S. That amounts to about 4.5 pounds of garbage per person every day. Of that trash, more than half ends up in landfills. What is a lowly consumer to do? Buy smarter and buy less (or less often). To some extent, manufacturers today have forced our hands: when a printer breaks, it is often cheaper to buy a new one than to fix the old one. However, it is important to curb our desires to always have the latest and greatest. Rather than toss old technology for the next big thing, try to hold out until your gizmo dies. And when it comes time to bite the bullet, make sure you recycle the old and your replacement is energy efficient. Buying in bulk will save you money on volume, plus you’ll also reduce the amount of packaging needed and the fuel it takes to acquire that item. Buying rechargeable batteries rather than single-use batteries will save money in the long run. Paying a little more now for a sturdier item that will last longer than the cheap alternative will result in fewer trips to the store. Switching to concentrated eco-friendly cleaning supplies will reduce the amount of bottles you recycle. A final thought: If it’s sold as disposable, do you (and the earth) really need to pay for the convenience? Paper plates and napkins…cell phones and cameras…cleaning wipes and dryer sheets. Just think of all the money to be saved and the trash to be eliminated by some changes in habit. Get ready for this: Americans discard nearly 100 billion pounds of food each year according to the EPA. Everything from food spoilage to that oversized meal that didn’t end up in your belly. When eating out, order only what you can eat and share some of those obscene portions. When at the store, buy only enough perishable items that you can safely use within a short period of time. Freezing leftovers is a great way to stretch your food and eliminate waste. And of course, composting your food scraps will keep excess food out of the landfills, all the while giving you amazing fertilizer for your very own garden. If it’s sold as disposable, do you (and the earth) really need to pay for the convenience? In addition to food waste, it is important to consider the environmental cost of food production. The United Nations cited in a 2006 report that raising animals for food generates almost 40 percent more greenhouse gases than all the cars and trucks in the world combined. Can you say vegetarian? The source of food is also worth noting. I’m sure you’ve heard the next catch phrase “local is the new organic.” In his book, Eat Here: Reclaiming Homegrown Pleasures in a Global Supermarket, Brian Halweil notes that “fruits and vegetables now travel between 1,500 and 2,500 miles from farm to market.” Those grapes from Chile aren’t earning any frequent flyer miles to get onto your plate. More and more stores are highlighting local produce, so be a supporter and eat more of what’s in season instead. Last, but not least: Grow your own! Having your own organic vegetable garden is a great way to save money and gas (and make use of all that compost). A short walk to the back yard or patio and you can have some of the best tasting fruits and veggies around. According to the International Water Management Institute, it is predicted that by 2025 1.8 billion people will be without sufficient water resources. Geographically, nearly half the globe will be affected. Now more than ever it is critical that we conserve water usage. Switching to a high-efficiency washing machine can save more than 5,000 gallons of water a year, including 2,200 gallons of hot water. Instead of using the garbage disposal, compost and save gallons every time. Wash your produce in the sink or a pan that is partially filled with water instead of running water from the tap. Then use that water for your houseplants. Don’t use running water to thaw food. Plan ahead and let it defrost in the fridge. Install an instant water heater on your kitchen sink so you don’t have to let the water run while it heats up. This will also reduce heating costs for your household. When you give your pet fresh water, use the old water for your houseplants. It takes 20 gallons of water to hand wash the dishes. A dishwasher uses between 12 and 20 gallons. If you ever needed a reason not to wash dishes by hand, here you go! Put food coloring in your toilet tank to check for leaks. Fixing a leaky throne can save more than 600 gallons a month. Fixing leaky faucets can save 140 gallons a week. If your shower can fill a one-gallon bucket in less than 20 seconds, replace it with a water-efficient showerhead and can save your family more than 500 gallons a week. Installing a hot water recirculating pump can save 8,000 to 10,000 gallons of water a year. A garden hose can use more than 10 gallons of water per minute. Sweep driveways and walks instead of using a hose. It takes 50 gallons of water to wash a car. Commercial car washes are recommended because the facilities capture the used water and send it to the water treatment plant, where it is treated and added back to the water cycle. Converting a 20 x 20 foot patch of grass to xeriscape can save about 15,000 gallons of water a year. Shutting off the sprinklers on rainy days can save 500 gallons of water in one day. Get out your calculators. The U.S. Department of Energy states that nearly one quarter of the world’s energy resources is consumed by the United States. One-fifth of that is sucked up in our very own homes. And approximately 60 percent of our home energy usage is in the form of electricity. Exactly how much is all of that? A lot. Which is why reduced energy usage in the home should be top priority. One-quarter of our electricity usage goes to lighting. Turn lights off when leaving the room and use timers for outside lighting. Switching from incandescent bulbs to compact fluorescent lamps (CFLs) will also reduce energy usage between 30 and 60 percent (just make sure to dispose of properly). Appliances consume approximately 20 percent of our energy, with refrigerators chewing up the most electricity. Turn off appliances when not in use and choose EnergyStar appliances whenever possible. Also beware phantom electricity: appliances that are off but still drawing power. Items that fall into this category are anything that still shows some sort of indicator light or display after it has been shut off. Where possible, plug them into a power strip and switch off the strip to really cut the power. Do the same for battery chargers (cell phones, PDAs, two-way radios, cordless power tools, etc.). Those chargers typically draw the same amount of energy whenever they are plugged in, charging something or not. Heating and cooling amounts to more than half of a typical American’s energy bill (natural gas for heating and electricity for cooling). Adjusting the thermostat by just two degrees can save four percent of your yearly energy bill. Save even more by using a programmable thermostat to regulate your home’s temperature when you are away. Caulking gaps and proper weather-stripping can save up to 10 percent or more each year. Water heating is the third largest source of energy consumption. Following some of the water conservation steps above will help. In addition, lowering the thermostat on your hot water heater will save three to five percent for every 10 degrees. Alternative energy sources are quickly rising in availability and slowly falling in cost, though it will be some time before these are viable for the mainstream consumer. Keep a watchful eye out for advancements in both solar and wind energy. Again, this is just a brief overview to get you thinking and get you started. In the areas of waste, food, water and energy there are countless ways to reduce your environmental hit. And there are numerous other areas in which to reduce your impact: transportation, alternative fuel, air pollution, land conservation, habitat protection, carbon offsets, just to name a few. But the purpose of this article is not to overwhelm, but to inspire. Get started on your green journey and keep a watchful eye for part three of the series where Green Promise explores the infamous second R: Reuse.